Of all the community card games and all poker games in general, Texas Hold’em is the one which holds the world’s attention; millions of players play this game online and offline and it’s ideal for home or casino play. Community card poker is a variant in which a number of cards are placed in the centre of table to be shared by all players. The aim of Texas Hold’em is to create the strongest five card hand according to standard high poker rankings. It’s played with blinds so the the two players to the left of the dealer must place the small and big blinds before the deal. 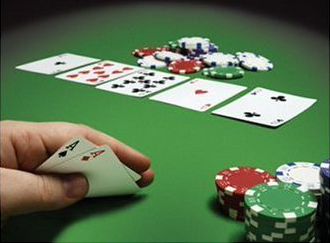 The Flop – The dealer places three cards face-up on the table and another betting round takes place. The Turn – The dealer places one card face-up on the table and a betting round takes place. The River – The dealer places a final card face-up on the table and a final betting round gets underway. If two or more players remain, the showdown can now take place and the cards compared according to the hand rankings. Limit Hold’em – betting in the first two rounds must be equal to the big blind; betting in the final rounds must be twice the big bling. No-Limit Hold’em – bets are unlimited (up to an all-in bet) with the minimum the size of the previous bet or raise. Pot-Limit Hold’em – the maximum bet is the size of the current pot.